Painting A Day: Original oil on gallery wrap canvas with painted sides. this painting does not need a frame. Yes, i have been gone for a long time. First at all I was busy with more commission work. This time it was a bathroom mural. It took all I had to paint on top of a ladder for days at a time. My clients are always so happy with the results it is worthy in the end. Yes, I do have other commissions on the horizon. So i may not post as often as I'd like. Also i had a set back. My computer had a defective hard drive and I lost a lot of data including my art files. For today's painting I sort of looked for things that I can get my brush around. This time I went to a nice winery but got struck by this attractive fountain. I like fountains. I think the main thing that inspires me is the constant and nagging wish to do better. This is what really keeps an artist going. I'm inspired all the time and am always filling up little art notebooks with ideas for paintings. The inspiration behind a lot of my work comes from wanting to express something within myself and usually associated with the things I love about life or have experienced. I keep motivated by looking at other people's art or by changing mediums. I just really love all aspects of creating art. 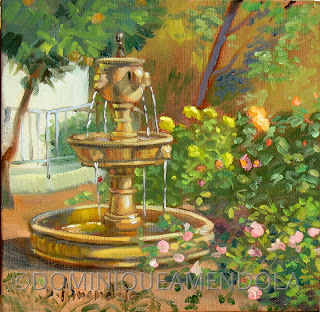 Size: 11"x14"- unframed painted on gallery wrap canvas with painted sides. Our model was dressed in red today. Red is not an easy color to paint. I focused first on the dress and painted her head later. This emphasizes the red cloth and her features are not as important. This is unusual for me. I love doing portraits and always focus on the face. But not this time. 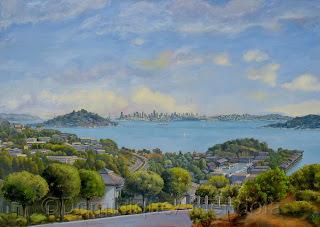 This beautiful view of the town of Tiburon was a commissioned piece. This is the piece I was working on for the past couple months. It is quite a process to paint such a large painting. First I painted a couple plein air color sketches on canvas and also did some studies in conte crayons. I also took some photos, but no photo can give you a sense for the colors. This is why it was so important to paint a few plein air pieces first. Then I went home and prepared a view from a collage of some of my photos, as well as some composition sketches. Composition is all important to me and play a big role in my paintings. However, i was limited by my clients desires to have a certain size. this left me me doing a panoramic piece with a 3 x 4 ratio when i would have wished for a 3 x 2 ratio for a more dynamic panoramic view. After deciding on the composition I painted a small version (as seen on this blog) of my future painting. I decided to stretch my canvas myself so that i could choose the best type of canvas without restriction. I have done this in the past. Since it was to be such a large size canvas, it took me a couple hours just to stretch the canvas to my satisfaction. I started the canvas with the sky and then established the landscape on top of it. The final result of all these steps is what you see. My clients are delighted with the results. 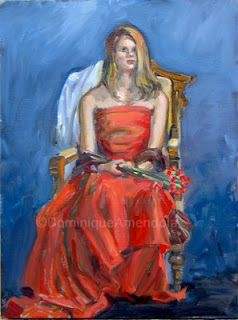 http://www.artdominiqueamendola.com and see the possibilities in the portrait section. By clicking on "how to order a portrait" you get a price list. This will give you an idea of what I charge. I have done portraits, landscapes and copies of old masters paintings for peoplein this way, actually the sky is the limit. You can email me about your plans and we can discuss what is possible. Click on the side views to see the effect of a Gallery Wrap canvas. This painting is a plein air painting. It was painted in my area in california. The fall colors are always beautiful. As soon as I am finished with my large commission painting I intend to paint more of the late afternoon light. Painting A Day: Original oil on gallery wrap canvas with painted sides. I have been working on a large 6 feet by 4 feet commission painting for the past couple months. I am finally coming to the end of it. I still managed to paint a few landscapes and one portrait. but only now do I find the time to post my landscapes. 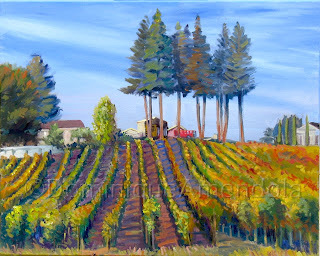 This landscape painting was executed in plein air. I live in california about 20 minutes from Petaluma. This particular street scene is located next to a canal. This is the old part of the town, with cobble stones. 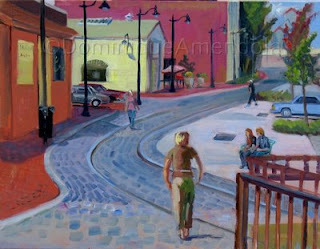 I particularly like to introduce figures in landscape paintings. A lot of tourists and locals walk around and visit the cafes in this area. It was difficult to capture people while they were walking, but thanks to my many years of figure studies, it came out alright.